The intelligent control system uses a single chip computer module combined with the technology of frequency converter. Widely regarded as one of the most comprehensive product in the current PRC market. Based on computer servo functions, this machine cleans square and rectangular air ducts while the flexible shaft is moving laterally and scrubbing the interior surface of the air ducts in a back and forth manner until all accumulated dust has been loosened. 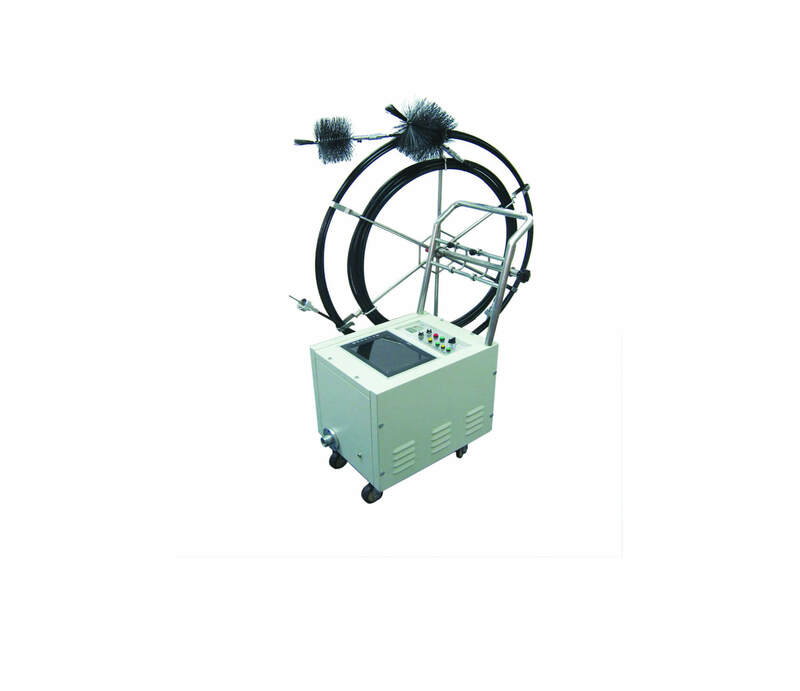 Similar to the Standard Flexible Shaft Air Duct Cleaning Machine, a provision has been made at the front end of the flexible shaft whereby a high power vacuum dust collector can be connected to extract dust while the flexible shaft is in motion (by way of direct dust absorption method). Alternatively, dust can also be extracted at the other end of the air duct through an external high power vacuum dust collector (by way of raised dust absorption method). Operating Range: Standard length 15 meter (provided with flexible shaft or semi-hard shaft); length can be extended up to 50 meter. Cleaning Mode: Cleaning shaft automatically rotating to the left or to the right, auto lateral back and forth rotating, continuous variable transmission. Cleaning Method: Raised dust suction method or direct dust suction method (Tornado cleaning system, maximum negative pressure up to 20,000 Pa. Range of Cleaning: Height 100~500 mm x Width 100~2,000 mm, and if round duct diameter should be 100~500 mm. Video Recording System: Complete set of intelligent synchronous monitoring and recording system. Optional Provisions: Complete set of rotational spraying sterilizer and high intensity UV bactericidal lamp.